Schools are helped by the fact that often a significant proportion of pupils will already have used K'NEX at primary school or at home, and will be able to help other pupils who are new to K'NEX to get started. The main curriculum areas for K'NEX are shown in the Curriculum pages. 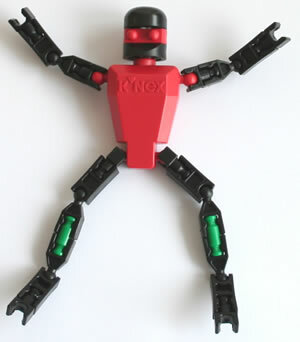 The versatility of K'NEX means that the same equipment can be used successfully throughout Key stages 3 and 4. K'NEX sessions for pupils aged 14+ can also be delivered as accredited learning units. Our K'NEX shop provides details of the many K'NEX education sets that are designed for secondary schools. These sets are much larger and better value than the K'NEX sets you can buy in the shops. The sets include general-purpose sets (such as the "Discovery Building" Set) and Curriculum sets (such as the "Exploring Machines" sets). 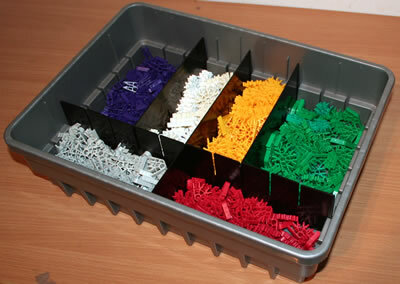 ♦ "Using K'NEX with Secondary Schools"
♦ We would suggest you put your students in groups of 2, 3 or 4 to use K'NEX. This will help them to develop teamwork skills and communication skills whilst they are completing their K'NEX projects. 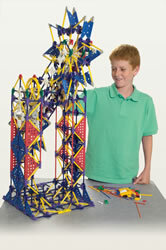 ♦ If you can afford it, we suggest you buy enough K'NEX for whole class use at one time. ♦ Once you and your students have built some or all of the models in the instruction book you received with your K'NEX set, you may like to consider building some of the simple K'NEX models found on the Models to build page of this website. 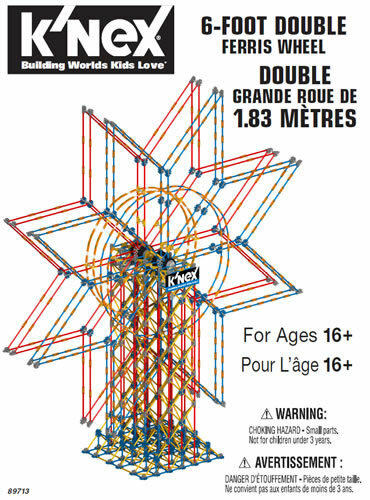 ♦ Once you and your students have gained full familiarity with K'NEX model-building techniques, we suggest you then move on to using K'NEX challenges. This will help you to use K'NEX to help develop your students' innovation skills and problem-solving skills. We hope the above comments are of some assistance. Please let us have your own ideas on how best to use K'NEX with students aged 12 to 16 - sharing good practice is one of our aims. The K'NEX User Group provided a K'NEX challenge to pupils aged 10 to 19 at the national final of the Young Engineers for Britain competition in 2004. The purpose of the challenge was to design and build a K'NEX model that would carry out a real-life manufacturing process, namely spinning a four-stranded "rope" from four separate spools of thread. Level 1 - Build a machine that will spin four strands together to create a rope. Level 2 - As level 1, and the rope is spun by turning a handle. Level 3 - As level 2, and turning the same handle will also wind the completed rope onto a drum. 2. The member of staff running the challenge completed the challenge, to gain familiarity with the types of problem that the pupils were likely to encounter. 3. Some of the Handy Hints from this website were printed out, ready to be provided by pupils on request. 4. Pupils were allowed to work in groups of two, three or four to complete the challenge. 5. A K'NEX set was provided for each pair of pupils, containing K'NEX rods, components, gears, pulleys, rubber bands, and four spools of thread. 6. Pupils were then allowed an hour to complete the challenge. 7. It took some time for the pupils to consider how the objective should be met, and to design the machine. Much discussion took place between group members, and prototyping of elements such as the spinning mechanism. 8. The groups all completed level 1 and 2 of the challenge, but some groups took only 20 minutes to do so, whereas others took nearly an hour. 9. The majority of groups then went on to attempt level 3. Again, much discussion took place on how this could be achieved, and in some cases the groups tried a number of alternative approaches. 10. By the end of the hour, about 50% of the groups had completed level 3. Both boys and girls performed equally well in the challenge, but it was noticeable that the younger groups of pupils aged 10 to 13 performed better than the older groups aged 14 to 19. This was partly because the younger group included children who had grown up using K'NEX , whereas not all the older students were familiar with it. The challenge is a particularly difficult one, and it was very pleasing to see that the pupils demonstrated good levels of achievement in both engineering design and lateral thinking. We would be pleased to provide a copy of the Challenge Card for the rope-spinning challenge, on request.